I am subscribed to three magazines. Glamour, Women's Health, and Fitness. I haven't read Glamour in quite some time. I was letting my subscription run out, but my mom renewed it as a gift to me. I used to read Women's Health religiously, until I read a snipit about nail moles and melanoma, and experienced my second true panic attack ever. I honestly thought I was dying. When I calmed down (and after I talked to my doctor) I was a little turned off by a magazine giving health advice. I understand its important to alert people to possible health issues, but I tend to take issues too seriously, and worry way more than necessary. I really haven't ever paid much attention to Fitness magazine. I really only subscribed because a year was $5 and I found a recipe in it that I really liked. 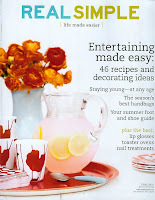 My mom is subscribed to Ladies Home Journal, This Old House, and Better Homes and Gardens. I like them all, but for different reasons. One reason being that I'm getting old and no longer care about fashion. I'm kidding. I think that the magazine Real Simple may be a good mix of all the subjects I'm interested in. I subscribed, but I have not gotten my first issue yet. I have been checking out the website and I like everything I see. You should check it out if you're old and boring like me. I'm sure I'll write more once I start getting issues.